Aims: New high variability extragalactic sources may be identified by comparing the flux of sources seen in the XMM-Newton Slew Survey with detections and upper limits from the ROSAT All Sky Survey. Methods: A detected flaring extragalactic source was monitored with Swift and XMM-Newton to track its temporal and spectral evolution. Optical and radio observations were made to help classify the galaxy, investigate the reaction of circumnuclear material to the X-ray flare, and check for the presence of a jet. 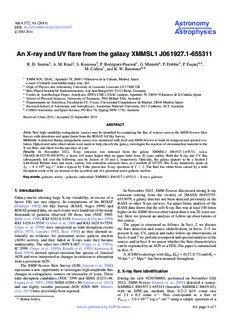 Results: In November 2012, X-ray emission was detected from the galaxy XMMSL1 J061927.1-655311 (a.k.a. 2MASX 06192755-6553079), a factor 140 times higher than an upper limit from 20 years earlier. Both the X-ray and UV flux subsequently fell over the following year by factors of 20 and 4, respectively. Optically, the galaxy appears to be a Seyfert I with broad Balmer lines and weak, narrow, low-ionisation emission lines, at a redshift of 0.0729. The X-ray luminosity peaks at LX ~ 8 × 1043 erg s-1 with a typical Sy I-like power-law X-ray spectrum of Γ ~ 2. The flare has either been caused by a tidal disruption event or by an increase in the accretion rate of a persistent active galactic nucleus.